I needed a good Bible study program for both myself and my son, and I found it with Real Life Press and Firmly Planted, Books of Moses Part 2. I am so blessed to have been chosen for this review! 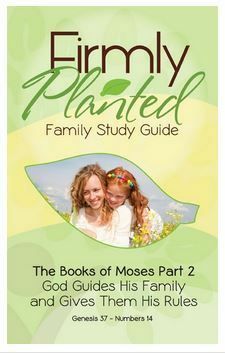 Written by Heidi St. John, Firmly Planted Books of Moses Part 2 is a 10 week study program that is broken down for the entire family. Each week gives you a main lesson, and you dissect that lesson in order to truly understand it. There are activities for younger children, older children, and the whole family. It is well written, provides ample Bible reading, and fun activities that are well planned and fun to do. This particular study begins at Genesis 37 and progresses into Numbers 14. For this review we received physical copies of both the Student Book and the Family Study Guide. These are available in other formats, as well, making this a very versatile product. These are the two books we received. They are well made, and "sturdy" enough for daily use. What did I love? Ummm...EVERYTHING?! Hello?! Heidi St. John wrote it, so you KNOW it is fantastic! We used Books of Moses Part 2 in a few different ways. First, we did the daily readings in the morning time as our family time activity. We had breakfast, read, and discussed what we had read before anything else. After this he had free play, and I did my own thing for a while. Then we began our daily school day, and I tried to find ways of working in the lessons we had learned during our morning Bible study. For example, we were learning about sink holes when we began the program, so we discussed sink holes and the pit Joseph had been thrown into. This was a lot of fun, and brought to life, even more, the stories we were learning. We skipped ahead to the Burning Bush because we were watching a documentary on the Weather Channel about weather events in the Bible. The Burning Bush was specifically mentioned in this episode, so we skipped ahead to cover that while the show was still fresh. While I suggested working through the way the program is intended, it was easy to skip ahead, then go back to where we were. I like the freedom that allows. The copy work was great because we used it to remember the verses, and to work on penmanship. We could work on block print, as well as New American Cursive. The verses, thus far, have been short enough so that Mr. B doesn't get tired, and he doesn't lose focus. All of the lessons are short enough so that you can easily complete them in a half hour or so, or you can make them more lengthy if you choose. It is really a matter of preference. We tend to go the shortened route due to the ADHD and lack of attention span. Ignore the "just got out of bed" hair. A page from the workbook to show the fun activities inside. A better shot of a copy work page so you can see what it is like. I love the artwork! Mr. Edwin, the cat, had to "supervise." I really like the use of picture icons. It made it easy for me to understand and help my son understand what we were being asked to do in the study. These icons also made it easier for me to know which activities may be too advanced for him, and which were right on par. Not only does the study guide tell you what these little icons mean, but during the lesson it lays it out for you so you know exactly what portion of the lesson falls where. In this case, "The Seed" was the thought that "God sometimes uses pain to advance His plan." Then it goes on to "Planting the Seed" which is the HOW things happened/happen. As you can see, the "Additional Planting the Seed" gives a recommended age level. "Watering the Seed" is how you make the overall main idea bloom. How you nurture that idea, and really get it to "stick" so to speak. I love the "Digging Deeper!" I often made this writing or narration prompts. Sometimes I used them as a mission quest or a mystery he had to solve. I also used these as art prompts. For the example shown, I asked him to draw the emotions you may feel if you were singled out as being both the favorite, and the not favored person. I also love how Heidi St. John makes sure that ALL members of the family can be included in this study. It really is a family focused product, from the youngest to the oldest. Overall, I think this is a well planned, well written Bible study program that the whole family can enjoy, and from which to learn. I think this is a great product that is affordable and long lasting. The lessons are short enough so that special needs/ADHD will be blessed, and there's enough room so that you can tailor it to fit your personal needs. You can add to it as you see fit, but it is also enough to be a stand alone program. It can be used for a family study, personal study, or even in a Sunday School setting. It has a lot of value for the incredible blessings it brings. I highly recommend Real Life Press and Firmly Planted! Please click below to read more reviews on a variety of Real Life Press products. They have so much to offer, please check them out!